It frequently happens that when we mention the name of our blog, the person responds, “Oh, I love champagne!” And I think to myself, “huh, we should really write about champagne someday…” Of course, it goes without saying that champagne pairs perfectly with a wide range of cheeses, but the use of its name here on the blog was originally intended to be somewhat tongue-in-cheek. Yes, we occasionally eat cheese with something bubbly, but really, cheese is perfect any time of the day, whether with coffee, chocolate, wine or even beer. Obviously, our focus here has been on the first half of the equation. Prosecco cocktails with pecorino, such as pecorino foglie de noce, and tallegio. For the real thing, champagne, stick with gooey French cheeses like Chaource. A warm crock of St. Marcellin is just the gooey sort of comfort food needed on a chilly winter night (assuming you’re not celebrating New Year’s in the Caribbean). Of course you can stick with domestic products too, like Virginia’s Thibaut-Janisson Brut de Chardonnay and Cypress Grove’s bubble-worthy Truffle Tremor. Some of my favorite cheese-and-bubbly pairings are not with wine at all, but with beer. Like Allagash’s effervescent Belgian-style White Ale with Jasper Hill’s Winnimere. And for little ones, or designated drivers, try sparkling pear cider with a good cheddar. We might suggest Cabot clothbound. Personally, I’ve got St. Marcellin and olives in the fridge for tonight, and an Oregon-inspired cheddar cheese ball in mind for watching the Ducks in tomorrow’s Rose Bowl. Jill’s planning a dressed-up comfort food meal of truffled mac ‘n cheese. 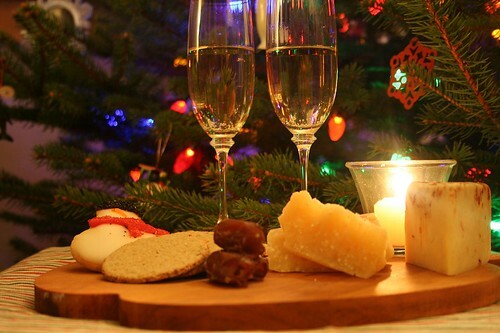 What are you enjoying your New Year’s cheese with? My allusion to the now-famous 15-year Cheddar produced by Wisconsin’s Hook’s Cheese Company a couple of weeks ago occurred before I got the notion to ask my friends Jim and Becca, who have spent the better part of November and December in our home state promoting their fabulous book, to pick up a chunk for me to taste. Alas, by the time they made it back to Wisconsin, it was hard to find this extra-special cheese anywhere in the state. But ever resourceful, Jim and Becca brought me back a tiny sample cup containing two chunks of the Cheddar from one of their book-tour stops, and it made its way safely back to Minnesota to my eager mouth. Was it worth the wait? Oh yes! This is, quite simply, the best Cheddar I’ve ever tasted, and you know how many Cheddars we’ve tasted over the past year. 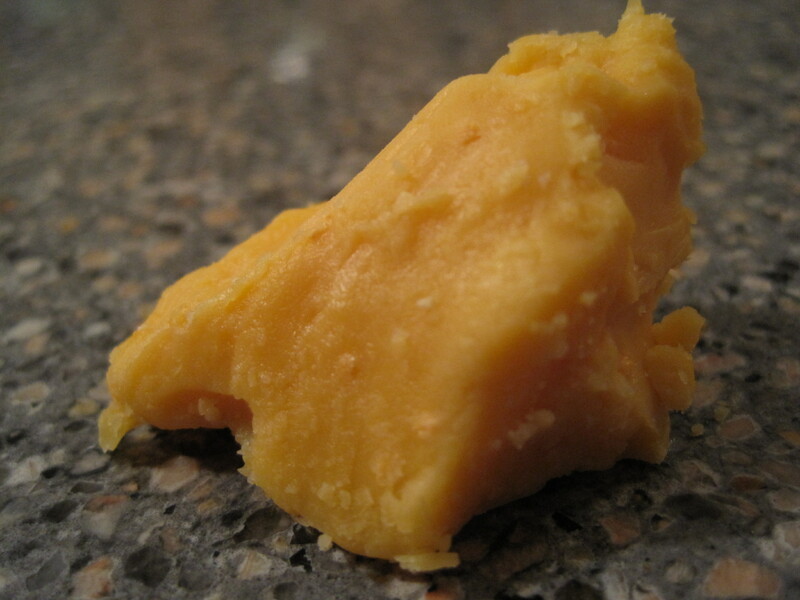 It’s the epitome of what a Cheddar should be. It is rich, creamy and caramelly with a few tiny crystals thrown in for good measure. Definitely worth its $50/lb. price tag, the 15-year Cheddar should become an award-winning cheese this summer at the American Cheese Society Annual Conference in Seattle. If not, those judges don’t know cheese. I’m guessing this Cheddar would make a fabulous mac and cheese or grilled-cheese sandwich, but I think it would be a crime to desecrate it by grating and melting. Just carve off little chunks and enjoy with a big red wine. If you know the recipient is a big fan of soft-ripened cheeses, a whole wheel of Brie, Chaource or Camembert makes a great gift, especially when paired with fruit preserves or chutney. Crowd-pleasers like Gouda or Cheddar are always a safe bet. If you’re still uncertain about your cheese choice, revisit our post from last year, with gift advice from Ken Liss, the owner of the recently departed Premier Cheese Market. Ken is also a wealth of information about unusual cheese pairings – my Heavy Table profile of him from last spring may give you some fun ideas. We know y’all love cheese balls because we get a ton of traffic to this blog from people searching for recipes. If you haven’t already, try Colleen’s version with Old Bay seasoning. The gift doesn’t have to be cheese itself. My husband gave me a beautiful marble cheese board for Chanukah this year, and fondue pots are always a hit. Every cheese lover needs a quality set of cheese knives, and babes will look fabulous in Murray’s “little cheese” bibs. And if you still have space on your tree, get one of these adorable cheese ornaments from Sur La Table. They almost make a Jew wish she had a Chanukah bush! 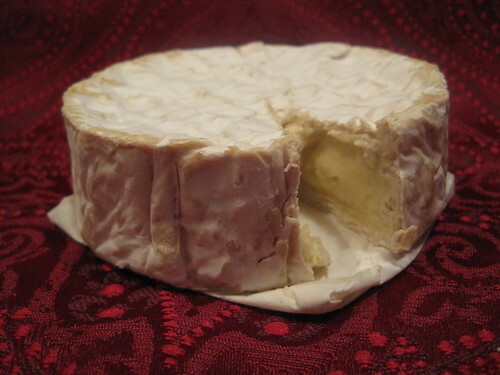 Camembert is one of those cheeses that I should really like, and don’t get me wrong, I don’t dislike it. But out of all of the yummy soft-ripened cheeses available today, it ranks toward the bottom of my list. Shocking, I know, to say such a thing about one of the world’s best-known and lauded cheeses, but it’s true. True Camembert is made in the Normandy region of France with raw milk, but of course, you won’t find it here in the United States because it isn’t aged long enough to meet our government’s standards. So we get a pasteurized version that purists would probably call an imposter, but unless you’re traveling to France, it’s the best you’re going to get. I haven’t been to France in nine and a half years and I wasn’t crazy into cheese then like I am now, so I’ve never had “real” Camembert and have no basis for comparison. But the pasteurized Camembert I did buy earlier this week just didn’t impress me. 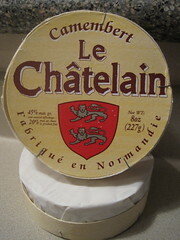 Sure, it had the creamy paste I adore, but the rind crumbled into tiny pieces that weren’t very pleasant to the palate. 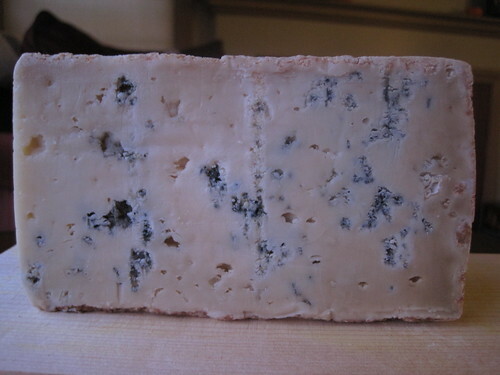 And the taste was more earthy and funky, for lack of a better term, than I typically enjoy in a soft-ripened cheese. Perhaps I didn’t let my wheel sit on the counter long enough (though I think two hours should be adequate), or I got an older wheel, but something tasted off. It wasn’t buttery or grassy, as Artisanal Cheese says it should be. Of course, I’m not about to let the rest of my 8-oz. wheel go to waste, so I’ll still eat it. I’ll let it sit out for three hours and maybe add some fruity accompaniments. My pregnancy won’t allow me to try Camembert with wine, unfortunately, but Wine Spectator recommends Chardonnay or hard cider from Normandy and Artisanal suggests Cabernet Sauvignon. Though the cheese world is all abuzz about the recent release of Hook’s Cheese Company’s 15-Year Cheddar, which the Wisconsin creamery is selling for $50/lb., this week our list takes us back to the birthplace of Cheddar – England. Currently made by the third-generation of Montgomery family cheesemakers in Somerset, this farmstead Cheddar is lovingly crafted seven days a week using milk from the family’s own cows. Y’all know how much I admire Wisconsin cheesemakers, but you’ve got to give props to the Montgomerys, too, who make their cheese on the land that some believe was the location of King Arthur’s Camelot! 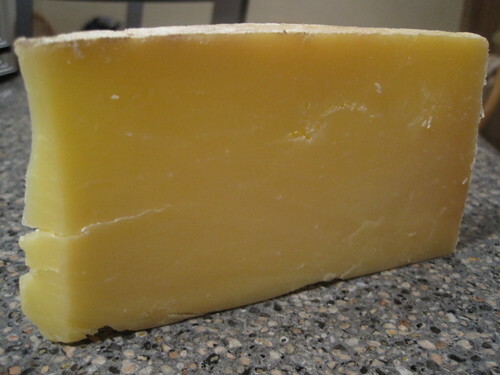 Montgomery’s Cheddar is made with raw cow’s milk and been aged for 14-20 months, so it’s possible that your slab may feature crystals, though mine did not. Instead, my piece was smooth, pasty and an almost bewildering bouquet of flavors. It was hard at first to place the taste – was this cheese fruity, flowery, nutty or sugary? The answer is: all of the above. It’s not a Cheddar with which to cook – it’s definitely for savoring in slow bites with pieces of fruit or nuts. 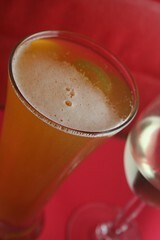 Your beverage should be a Claret or nutty lager.